Ingredients: saponified oils of olive, coconut, soybean, castor, avocado oil, beeswax, cocoa butter, goats milk, ground oatmeal, honey. 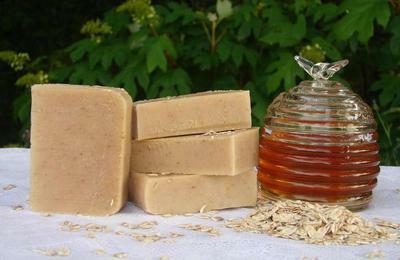 Naturally unscented and filled with soothing ground oatmeal, honey and goats milk. Gently cleanses and exfoliates. Always a favorite! I love your soaps! The Oats-n-Honey is so soothing on our dry skin, so next time I order I'll be getting more of that. I am really a liquid soap type person so I am surprised how much I love your soaps. I love all the face products they are amazing and my face has never been so soft. Also I use the oats and honey soap on my 17 month old son and I do not even have to put lotion on him!! Love it!